Andy Warhol’s estate is cashing out. A quarter-century after the Pop artist died, his art foundation is about to upend the Warhol market by auctioning off the rest of his estate—including more than 20,000 works it expects to sell for a total of more than $100 million. The Andy Warhol Foundation for the Visual Arts said Wednesday that it has enlisted Christie’s to help sell off its remaining inventory of silk-screen paintings, drawings, prints, collages, photographs and archival materials because it no longer wants to broker occasional sales of these objects on its own. Chairman Michael Straus said the foundation aims to use the proceeds to increase its $225 million endowment and expand the scope of its art-related grant programs. “We’re converting art into money,” Mr. Straus said. Warhol is one of the art market’s top commodities, and this selloff could significantly recalibrate his prices because the foundation is putting so many pieces into broader circulation for the first time. These include at least 350 paintings and 1,000 prints, plus thousands of drawings and unique photographs the artist took during his four-decade career. Alberto Mugrabi, a New York dealer whose family owns at least 800 Warhols, said the estate has hinted for over a year that it might want to close up shop, and Mr. Mugrabi said he and a few other dealers offered to buy it, but the foundation declined. Now, he said, he worries the foundation will “dilute” the Warhol brand by flooding the market with too much material at once. “It’s ridiculous—they have a great product, and they’re pushing it out into the market like cattle,” he added. Warhol’s prolific output has long been sifted and traded on varying levels, with collectors paying a premium for the 8,000 paintings and sculptures he produced between 1952 and his death in 1987. These still turn up at auction so consistently—about 200 works a year—that they have become a bellwether for the entire $25 billion art market. Last year alone, auctions sold $346 million worth of his art, according to Artnet, a database that tracks auction sales. But farther down the artistic food chain, there are plenty of collectors who continue to chase the more than 100,000 photographs, prints, film negatives and drawings on sketchpads that Warhol created alongside his best-known silk-screens of Hollywood starlets. Prices for these lesser-known works can fluctuate wildly from a few thousand dollars for a photograph to more than $5 million apiece for a drawing. Mr. Straus said the estate isn’t sitting on a slew of soup-can masterworks, but what’s left does cover the entire arc of the artist’s career, from his early years as a commercial illustrator to his Pop art to his final days as a New York social fixture, with a Polaroid camera regularly hanging around his neck. The foundation has timed its sale on the heels of a major retrospective of the artist’s work, which opens Sept. 18 at New York’s Metropolitan Museum of Art. Since none of the estate’s remaining material has ever been sold—or even seen by the public—before, Christie’s is preparing to market it as a treasure trove. The auction house, a unit of London-based Christie’s International PLC , said it would kick off the sale by offering roughly 350 Warhol works on Nov. 12 in its New York auction room, followed by a series of online-only sales of lower-priced pieces next February and for years beyond. Highlights include “Three Targets,” a 19-foot-long silk-screen showing a trio of bullet-riddled bull’s eyes, estimated to sell for at least $1 million. 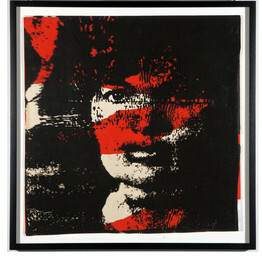 “Jackie,” a red 1960s screen print and paper collage portrait of Jacqueline Kennedy, has an estimated sales price of at least $200,000. Among the thousands of Polaroid photographs is a late-1970s “Self Portrait,” in which the artist wears black sunglasses and his signature silver wig. Christie’s expects it to fetch at least $15,000. Christie’s specialist Amy Cappellazzo said the auction house intends to space out its online sales over several years in order to avoid offering up too much material all at once. It also will broker some sales privately. “We know Warhol’s market well, and we how to turn the tap on and off,” she added. However the works fare at auction, the huge divestiture amounts to a major reorganization of one of the art world’s most powerful entities. For years, dealers and scholars have gained entry into the foundation’s warehouse in New York’s Chelsea neighborhood in hopes of unearthing an overlooked Warhol masterwork to buy or borrow. Plenty more have sought help from its auxiliary authentication board about other potential Warhols, a service it quit offering last fall after several of its rulings spurred costly law suits. Market watchers will likely keep a close eye on the sales, in part because they could alter the value of Warhol’s works on paper, which haven’t seen price spikes to match his silk-screens over the years. The top price for a Warhol work on paper is the $4.2 million that Sotheby’s BID -2.49% got three years ago for his pencil drawing of a wad of money, “Untitled (Roll of Dollar Bills).” Auction sales of his prints fell by a third last year, to $25 million, according to Artnet. Next spring’s sales of Warhol works will also mark the first time Christie’s offers fine art using an online-only sale format—a potential game-changer for an industry that drums up much of its buzz from theatrical saleroom auctions. Christie’s CEO Steven Murphy said the company began experimenting with online-only sales last year by offering some of Elizabeth Taylor’s estate pieces, followed by a series of online-only wine sales. The results—along with bidders’ willingness to click and bid on pieces during live sales—encouraged him to expand with name-brand art. “I think it’s going to blow open the doors to a wider, global audience than we could reach in a traditional sale,” he said. If successful, Mr. Murphy said Christie’s may offer additional artists’ works in online-only sales in the future. Rival Sotheby’s experimented with online-only sales over a decade ago but ended its deal with eBay Inc. in 2003 after bidders shied away. Mr. Kasmin, the dealer, said he has been curious about the full contents of the Warhol estate for years; now, he is resigned to sorting through it online. “I would have liked to have gotten in there before everyone else,” he said. When it comes to reviving online-only sales, Warhol may have a leg up on other artists in part because his name and style are already familiar with collectors around the globe. The fact that these works come directly from his estate also helps confirm their authenticity in a realm where fakes abound, particularly in the prints marketplace. Re-posted from The Wall Street Journal.